Riz Ortolani - House On The Edge Of The Park. Vinyl LP. Bleep. Composer Riz Ortolani didn’t shy away from scoring gruesome movies. After all, this is the man who wrote the music for Cannibal Holocaust, a film that’s in with a shout to be the most controversial of all time. 1980’s House On The Edge Of The Park was a similarly gory affair, and another flick made all the more disorientating by a surreal soundtrack from Ortolani. 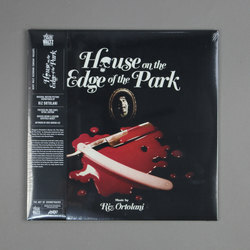 With its cerebral blend of lounge, library funk, doom jazz and breaks, the music for House On The Edge Of The Park joins the dots between Goblin and Angelo Badalamenti.